Cannon Beach is a city in Clatsop County, Oregon, United States. The population was 1,690 at the 2010 census. 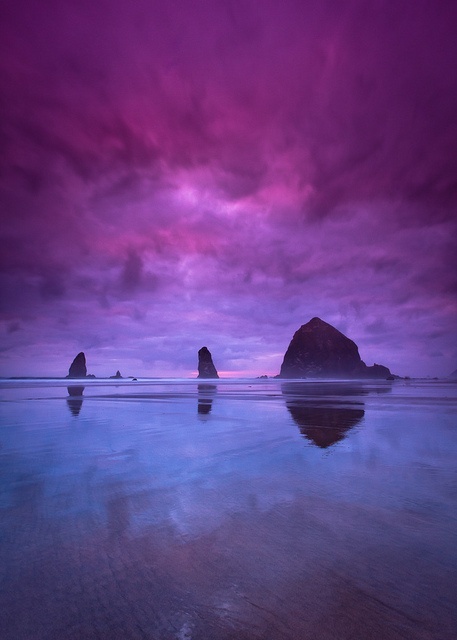 he first recorded journey by a European to what is now Cannon Beach was made by William Clark, one of the leaders of the Lewis and Clark Expedition in early 1806. The expedition was wintering at Fort Clatsop, roughly 20 miles to the north near the mouth of the Columbia River. In December 1805, two members of the expedition returned to camp with blubber from a whale that had beached several miles south, near the mouth of Ecola Creek. Clark later explored the region himself. From a spot near the western cliffs of the headland he saw "...the grandest and most pleasing prospects which my eyes ever surveyed, in front of a boundless Ocean..." That viewpoint, later dubbed "Clark's Point of View," can be accessed by a hiking trail from Indian Beach in Ecola State Park.